I'd love to know what comics Grant Morrison would write if he had his own company. Forget the army of clones and moolah required to pull it off, this is a guy whose 'luke warm' issues I re-read more than others which seem better on release. Fact is his work is always fresh and packed with so many ideas, you actually feel like you are getting your money's worth out of your ten minute read. Now he's recreating Superman, a character he calls the "greatest idea we've had as a human species". I can't wait. I once thought reinventing Superman was like 'Ultimate Bible' - something that just didn't need doing. Superman is bigger in the real world then pretty much all Marvel combined - so why 'Ultimateize'? Now this is interesting. I've always wondered what an "Ultimate" DC would look like. Still don't think it's necessary to renumber the books, though. Just keep it a separate line - or is that what DC is doing? That's a good question Pensol - with the Justice Society pretty much missing as well as Captain Marvel, something feels like it's still to be revealed doesn't it? It's all very intriguing. 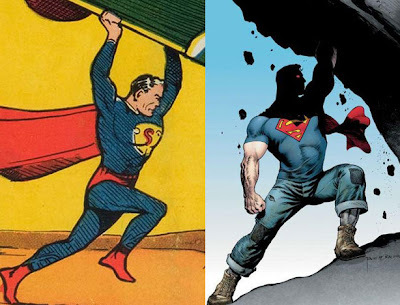 Do we know yet whether the Superman Superman is the same guy as the Action Superman? It seems as if we're getting different Earths. Thanks Martin - I think so aye but being male I have been know to be wrong before! Hope you are having a great June!